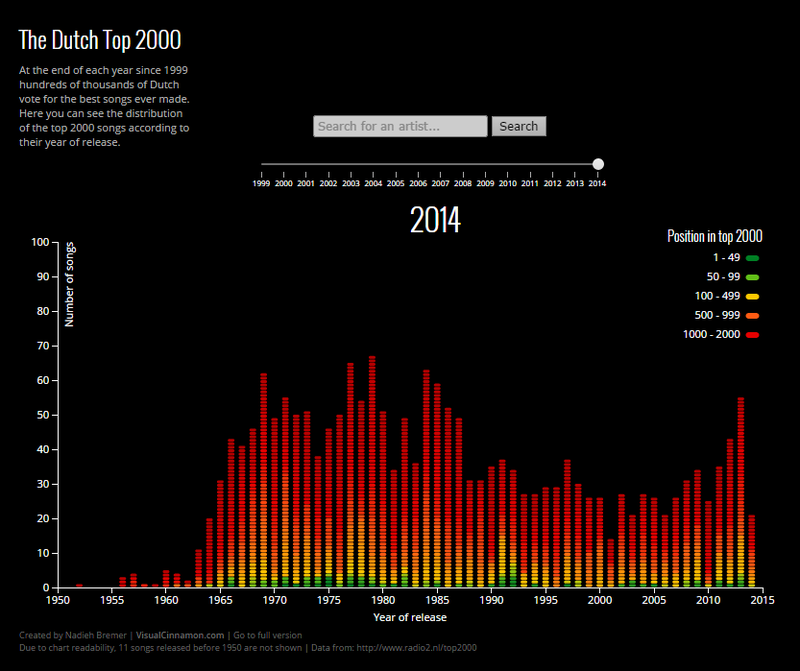 The Top 2000 is an annual radio show of the Dutch station NPO Radio 2. It was first aired in 1999. During the week before the new year the 2000 most popular songs ever are played. This top 2000 is determined by internet votes of the listeners in the weeks prior to Christmas. I think I remembered hearing that this year they had received 3.3 million votes for songs. However, each person can vote for multiple songs (maximum of 20). Therefore, the number of people who voted is more likely to be around 300.000, if I assume an average of 10 songs per person, which is still about 2% of the Dutch population. While listening to the top 2000 songs counting down, I started wondering several things about the data. Some high ranking songs were completely new to me the first time is listened to the Top 2000 a few years back. Therefore, I wondered how different the Top 2000 would be when only looking at voters from my age range? This year I decided to try and find some data about the Top 2000 list. Although the Radio 2 site has a Facts and Figures section, this only contains some top 10 lists (and no visuals either). Luckily, they do have an Excel with artist, song title, the rankings of each year since 2014 and release year of the song. While thinking about creating the distribution bar chart, I thought it might be fun to try and create the bar chart as an equalizer, where each song would be one rectangle of a bar. After a quick online search I couldn’t find any d3.js example to start with, but then I realized that it wasn’t a bar chart at all, it should be seen as a scatter plot. I had to create an array to hold the height of each bar (release year) while d3 would loop through the data and plot them at the correct location. I think the transition between years should be faster. I put in a delay per element, so it feels similar to how an equalizer works, building the bars up, but at some point decreasing the duration of the transition or length of delay didn’t have any visually noticeable effect any more. Because the slider didn’t really give a good UX on a mobile I made an adjustment so the visual only loads the latest dataset, when it is viewed on a handheld device. The slider is replaced by a note saying that you can view other years when visiting the webpage from a pc/laptop. I tried making the chart somewhat adjust to screen size. Not sure how well that works though (it is still not really meant for mobile screens). Luckily there seems to be an upward trend since 2000 if you look at the results from the 10’s. Thanks to artists such as Coldplay and Adele. It appears that the years around 1970 had to pay the most for the songs made after 2000 in the 2014 list. Nonetheless, the 70’s do show the highest concentration of very high scoring songs (seen in green colors). The complete 2014 top 4 is from the 70’s actually.